Scoozi is a twenty-six year-old, 13,500 square feet, Italian Restaurant with 370 seats in Chicago’s River North Neighborhood. Scoozi opened twenty-six years ago. It was JMA’s first big project with Lettuce Entertain You Enterprises. The site for the 13,000 square foot restaurant was a pre-world war two bow-truss garage in Chicago’s River North. At the time the neighborhood was in transition, in the midst of a slow transformation from a light-manufacturing district to a young neighborhood of heavy-timber lofts adapted to house artists, designers, photographers, residents, office workers and destination entertainment spots. Scoozi’s design grew out of the industrial-rustic character of River North, and the contrast of modern and traditional designs in Milanese cafes. Continuity was maintained by referring to an imaginary narrative invented by the team. JMA developed a theatrical plan focused on a bar. The bar is pushed up against tall windows at the street, which replaced the garage doors on the façade. Richard Melman, the founder of Lettuce, imagined Scoozi as a “bar where one could eat”. The terraced dining rooms overlooking the bar-stage accommodate 300 diners. The dining rooms are outfitted with banquettes and booths in the configuration of some of the most enduring grand cafes of central Europe. Yellow awnings, hand-painted on the floor of JMA’s studio, shaded the window which was also the back bar display. JMA created chandeliers composed of metal plates, exposed incandescent lamps and retractable industrial curly cord hung with wire cables with turnbuckles. At the time, River North had few pedestrians. 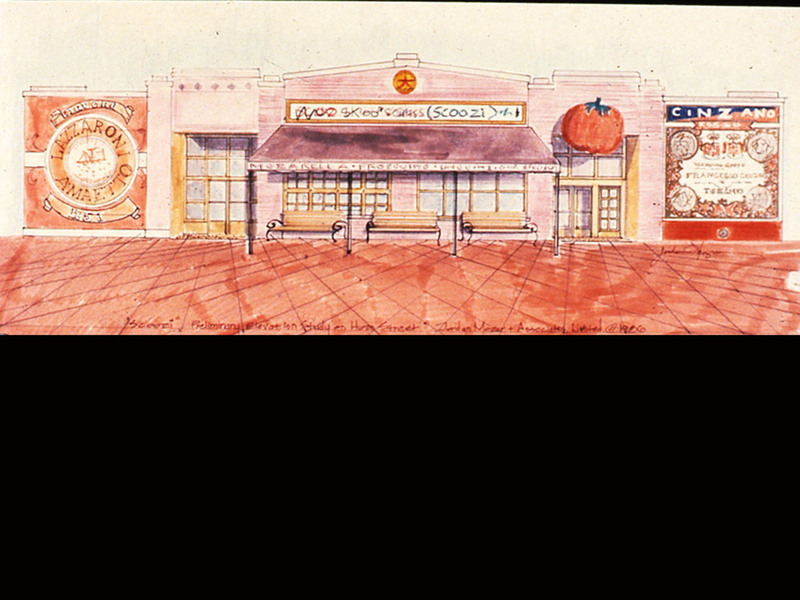 To attract attention a 365-pound hand-sculpted tomato with a steel skeleton was hung over a refurbished 1920’s revolving door flanked by murals of magnified Italian beverage labels.